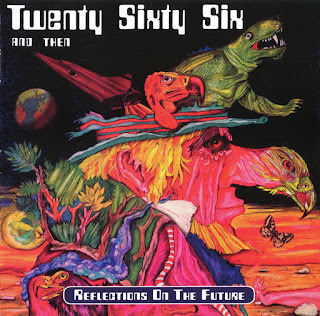 You just have to love these rarities that get unearthed from the vaults from time to time, and this particular release from the folks at MIG Music comes from the German band Twenty Sixty Six and Then, their lone album from 1972 titled Reflections of the Future. Originally signed to United Artists Records, the album was released by the band and proved to be a hit with critics, but ultimately didn't catch on and the band quickly broke up about a year later. It's a real shame, as Reflections of the Future is a spectacular album chock full of bristling dual Hammond organ, heavy guitar work, and the soulful vocal pipes of Geff Harrison, the only British member of the band. Fans of Deep Purple, Iron Butterfly, Black Widow, Atomic Rooster, Nektar, Black Sabbath, Uriah Heep, and Vanilla Fudge will find much to love here. "At My Home" kicks things off with beefy guitar riffs, flute, and swirling Hammond organ, the acrobatic rhythms playfully keeping the hard rock thunder in check while Harrison's bluesy vocals soar over the top. It's an instantly catchy and heavy song, with Gagey Mrozeck's guitar lending plenty of muscle and the dueling Hammonds courtesy of Veit Marvos & Steve Robinson playing up a storm. Doom laden riffs, Hammond, and Mellotron permeate the creepy "Autumn", a near 9-minute journey into dark progressive rock that starts out all Sabbathy but then catapults into complex Purple/Heep styled mayhem. For "Butterking" the Mellotron again makes an appearance, colliding with huge, majestic riffs and tumultuous drumming from Konstantin Heinrich Bommarius and nimble piano, eventually giving way to gorgeous acoustic guitar picking and ominous vocals before a full on prog climax. The 15-minute title track is of course epic in every way, Dieter Bauer's booming bass weaving around Mrozeck scorching guitar and waves of Hammond organ, the band flowing back and forth between bluesy atmosphere to raging hard rock, psychedelia, and prog. Fantastic stuff. "How Would You Feel" allows the listener a bit of a breather after all the thunder, as lush piano and Mellotron float underneath Harrison's emotional vocal, the tune more of a psychedelic pop song compared to the heavy rock & prog that came before it. This 2CD reissue contains a wealth of bonus material, starting off with a live in studio version of "At My Home" which adds almost 3 minutes of extra jamming to take this already super song to another level. "The Way That I Feel Today" brings the bands blues & jazz leanings into play, featuring plenty of piano and flute solos to go along with rampaging guitar & organ jams. Think early Iron Butterfly at the height of their powers. The colossal "Spring" is a duet for two Hammonds, Bommarius' drums steadily keeping the beat while both organs lay down a wealth of grandiose sounds. If you are a Hammond organ lover, this is the song for you. "I Wanna Stay" is pummeling hard rock not far removed from early Deep Purple or Uriah Heep, as is "Time Can't Take it Away", with rippling bass, wah-wah guitar riffs, Hammond, and multi-part vocal harmonies soaring to the heavens. A few demo tracks of pretty sub-par quality are also included, the very proggy "Winter", the bluesy pop piece "I Saw the World", and the completely different, R'n'B tinged number "You Are Under My Skin", which appears to be a Steve Robinson solo piece recorded much later. Though the booklet is sadly all in German, it no doubt contains a wealth of information on this long forgotten but totally formidable band. 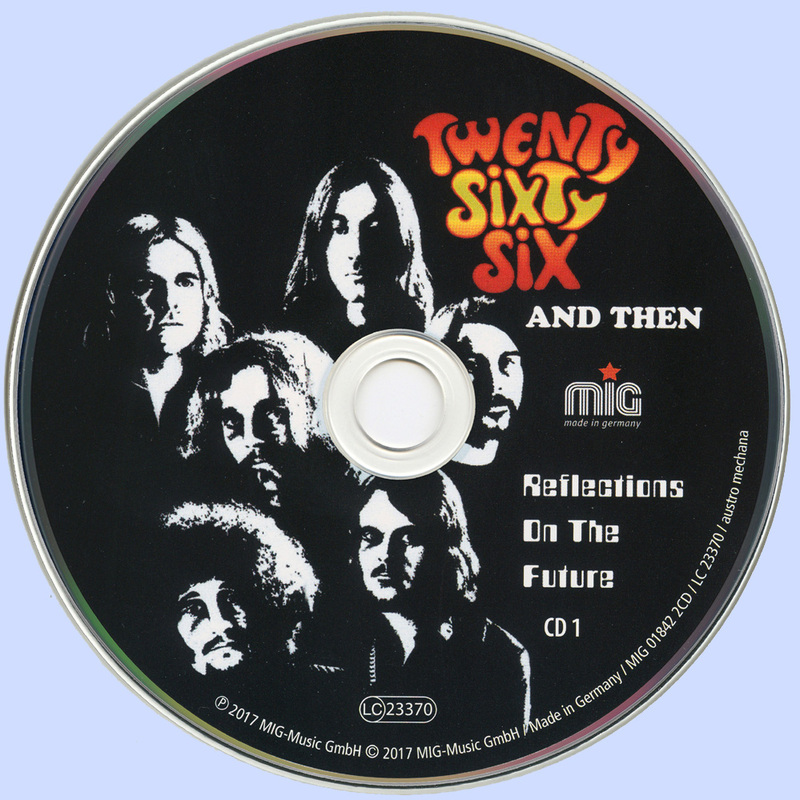 If you love discovering heavy rock rarities from the '70s, this little gem from Twenty Sixty Six and Then will need to be on your immediate radar. Fans of hard rock guitar & Hammond organ certainly need apply! !